German Import | Jewel Box Edition | Nihlistic Suicide Pop | This is one of Sam’s favorite of all the “darkwave” CDs Projekt.com distributes. Imagine Nick Cave, (Marc & the Mamba’s era) Marc Almond, a bit of Voltaire and Ennio Morricone’s spaghetti western strings bewailing the grievances of Machismo caught between an overwhelming drive for freedom and a romantic desire for eternity. It’s a highly stylized album of catchy songs which enigmatic Italian band-leader Simone Salvatori refers to as “Suicide Pop.” Vibrating guitar riffs, pointed piano chords, devoted strings, driving drums and acoustic guitar support expressive male vocals (sung in English). Brilliant stuff! 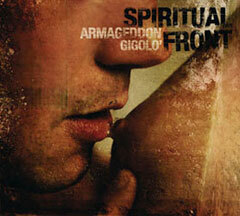 Love and suffer with SPRITUAL FRONT!With fervent ballads combining “Mafia-folk”, Nick Cave and Ennio Morricone – refined with a shot of Rock’n’Roll-Spirit- the Italian project SPIRITUAL FRONT along with their likeable singer Simone Salvatori have nestled cosily among different styles of music. What once started as a mixture of acoustic pop and free-style folk has soon turned out to be a charismatic live act and is just about to astonish the music business with their highly exceptional vision of ‘Suicide Pop’. Supported by the musicians of the Ennio Morricone-Orchestra, the new album skillfully combines Western – and Ganster film atmosphere and the aura of great entertainers which melt into a genuine, post-modern mixture. The result is music for the anarchistic youth of the future inspired by the spirit of the past. Vibrating guitar riffs, pointed piano chords, devoted strings and a subtle acoustic guitar support expressive English vocals which bewail the grievances of Machismo who is caught between an overwhelming drive for freedom and a romantic desire for eternity. This album definitely is a straight tip for all Bad Boys & Girls out there, for anarchistic rebels – and machos with a tender heart. Love and suffer with SPRITUAL FRONT! The limited first edition is now sold out. It came with a luxurious packaging: a 6-page digipak with a 16-page booklet.